This chart may be republished with proper citing. Click chart to enlarge. The good news first: Overall, line of duty deaths are down by 12% this year compared to the same date last year. As of February 25, 2011, America has lost 30 law enforcement officers in the line of duty (compared to 34 on February 25, 2010). The bad news: We've seen nearly a complete reversal on recent trends which held that auto-related incidents are the leading cause of fatalities. This time last year we had suffered only 9 deaths by gunfire and 16 in auto-related incidents. This year it is almost a mirror image: 16 felonious deaths (15 gunfire and 1 assault) and 9 auto-related incidents. 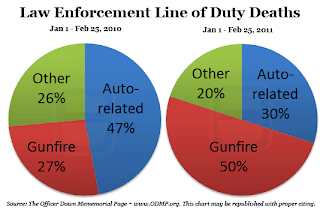 Over the past decade as auto-related incidents overtook shootings as the leading cause of fatalities there has been a tremendous amount of attention given to safer driving initiatives - like the Below 100 initiative - both for law enforcement officers and the general public. Case in point, most states now have "Move Over" laws that are being heavily enforced on our highways. Just as important, FTOs, academy instructors, and patrol sergeants are changing the traditional law enforcement culture of not wearing seat belts and driving too fast to calls. These simple awareness campaigns seem to be doing their part this year in reducing the number of traffic related deaths. Without impacting the great headway we've made this year in reducing auto-related deaths, all officers need to maintain that heightened level of awareness that criminals today are more brazen and showing less regard for human life - their own and the officers. Reducing both traffic-related deaths AND gunfire deaths is the only way we'll be able to truly drop line of duty deaths "Below 100."